On Saturday Nicola set out a range of new policies which your SNP government will deliver if they are re-elected in May. This summer the SNP will embark on a new initiative to build support for independence. Nicola outlined the next steps to build a strong majority for independence – to hear and address the concerns of those who weren’t convinced to vote for independence in 2014. That is how the 45 per cent of September 2014 will be turned into resounding yes vote. – and, introduce payments of £250 for low-income families at other stages in children’s lives – when they begin nursery and again when they start school. The SNP Scottish Government has already delivered free school meals for primaries 1 to 3, benefitting 135,00 children across Scotland and saving families around £380 a year for each child. If re-elected, when we expand early years education to include full day provision, we will also extend free meals will be extended to 2, 3 ad 4 year olds in our nurseries. The Scottish Attainment Fund – introduced by the SNP in government – is helping to improve literacy and numeracy in over 300 primary schools in Scotland’s most deprived communities. An extra £100 million in funding raised by progressive changes to council tax will see the reach of the Scottish Attainment Fund extended to every part of Scotland. Funding will go directly to head teachers, enabling them to invest in extra teachers, classroom assistants, equipment and additional learning support. Under the SNP funding for Scotland’s NHS is at record levels – now £13 billion. If re-elected an SNP government will continue to increase the NHS resource budget in real terms every year of the next parliament. If re-elected in May an SNP Scottish Government will invest an extra £50 million to help more people beat cancer, with new state-of-the-art radiotherapy equipment and an extra 100 radiotherapy specialists. The Scottish Government’s current Digital Scotland programme will deliver broadband to 95 per cent of premises across Scotland by the end of 2017. The remaining 5 per cent will be in some of the hardest to reach areas of rural and remote Scotland. If re-elected an SNP government will make sure no community is left behind. Over the next Parliament superfast digital broadband will be delivered to all premises across Scotland. These are the sort of policies that make government worthwhile, and should be effective in attracting votes. I am all in favour so long as they can be financed. 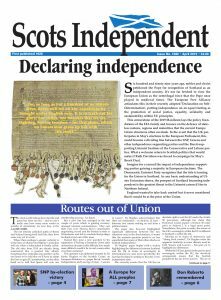 After independence, and the need to slot Scotland into the global political and economic framework, I hope it will be possible to maintain this level of social service, but there will be a completely new scenario to cater for then, and its financing will have to be rethought in the light of the new situation.